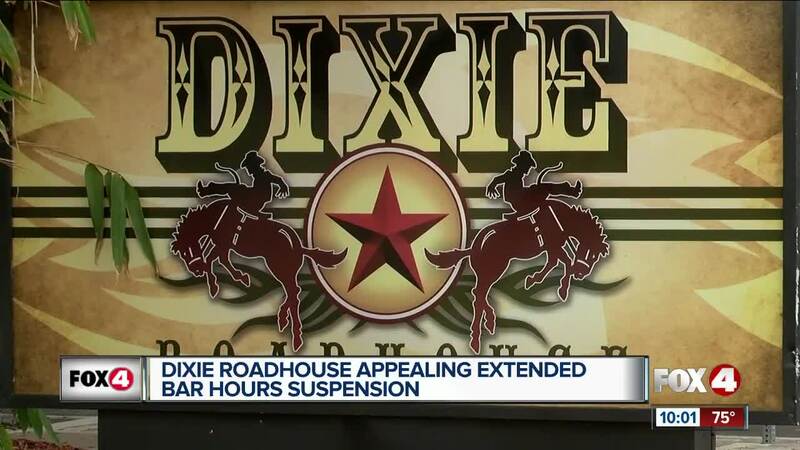 Dixie Roadhouse plans to fight a recent suspension of their extended hours permit, which allowed them to stay open past 2:00 a.m.
CAPE CORAL, Fla. — Dixie Roadhouse plans to fight a recent suspension of their extended hours permit, which allowed them to serve drinks until 4:00 a.m. Earlier this month, 40 people got into a fight which spilled out into the streets and some were yelling gang affiliated comments, according to Cape Coral Police. Business owners nearby said this isn't the first time customers from Dixie Roadhouse have caused problems. "We will have people that are come to our door, completely over consumed with alcohol, at 7 or 8:00 at night during the week, and we won't even serve them food because they can't sit in a chair and you don't want them in the building," Shannon Yates, owner of Nevermind Bar. Police said they've noticed members of the bike gang "Outlaws" and "Eternals" leaving Dixie Roadhouse late at night. Cape Coral Police Chief David Newlan said Dixie's owner isn't doing enough to stop the gang members from entering the bar, or refusing to serve patrons who are too drunk. A special city council meeting will be held on January 8 at 4:30 p.m., and it will be open to the public.